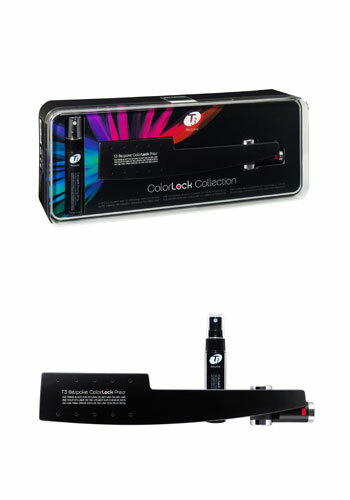 This Colorlock Collection is the best way to help you keep the color stay on the hair from the moment it’s applied. This collection includes one Colorlock Press and one Colorlock pressing spray. The Colorlock Press uses penetrative, non-damaging high heat and features Zeolite and Tourmaline-infused plates with a patented ‘dimpled’ design to seal in and preserve color so that it won’t fade. The Colorlock Press Spray includes moisturizers and color-sealing ingredients which can reduce color fading, enhance existing color and restore hair’s natural vitality. After the hair is colored and washed with shampoo, keep the hair wet and apply about 10 pumps of spray all over the head. Comb through and then hold 2" wide sections of hair by the colorlock press, once over the whole head area. Dry and style as desired and repeat the process 2-3 times per week. Please read full instruction on the package before use.